The low-medium-high switch controls voltage to either one, two or all three heads to get the three different levels of braking. You can unplug wire right at the head and use a volt meter to see if things are working. Key on, engine off and a friend working switches with you on the meter should be able to track down your issues pretty easily. Good luck. If your needle and seat is not sealing 100% that would cause your rich condition when running. when you shut it off that electric pump could be holding pressure between it and the carb letting it overfill the carb and dripping gas into your engine every time you shut it off. Is the fuel level in the tank higher than the carb? If so it can easily be siphoning gas into your engine if that needle and seat are leaking by. Not sure your dodge is like this or not but some newer vehicles send a low voltage through the circuit and read the return from ground as a way for the computer to know if the bulb and wiring are all good. Not enough to light the correct normal bulb but enough to light the LED maybe More likely it has an issue in the turn signal switch that’s carrying a small voltage across when in off position. My two cents worth. If any of these ideas work just mail the pennies to my PO Box. Good lick. 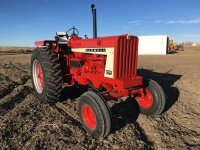 IH 806 3 point won't stay "up"
Most likely cause is hitch piston seals. You can take top link mount off and look in there and see. With hitch up and tractor shut off if there is oil leaking past that seal you can see it dripping or running out that cylinder. Looks like someone took good care of it most of its life. Great find. do they make any easier couplers? Might be worth putting new guts in your current coupler bodies. I did this on our 5488 and it’s working waaay better. I think decades of use and dirt made them hard to hook up. I had to go look again. I didn’t even notice she had a head. My roadrunner has gas cap behind the license plate. You can pull up to the pump on either side and be ok.
1959 B120 all wheel drive. One thing I forgot, I think that there is one short bolt that is tucked away on the left side that needs to come out Good lord my memory is getting bad. PTO is easy. Remove linkage. Take out bolts one at a time. There are long and short bolts. Leave the long ones out but put short ones back in ( they keep unit together) it just slides out as a unit. Very heavy so use a engine hoist or a strong friend, the shaft you see in your picture has a simple splined coupler that just slides apart, leave shaft in the tractor as you are pulling it out it will need to be tipped down so that the oil pickup tube clears.